There’s something fabulous happening in Málaga – stunning street art – and I’m not talking about graffiti. “Málaga Arte Urbano en el Soho” (otherwise known as MAUS) has invited international urban street artists to create fabulous pieces of art on the walls around Málaga’s “Barrio de las Artes“, the bohemian Soho district. 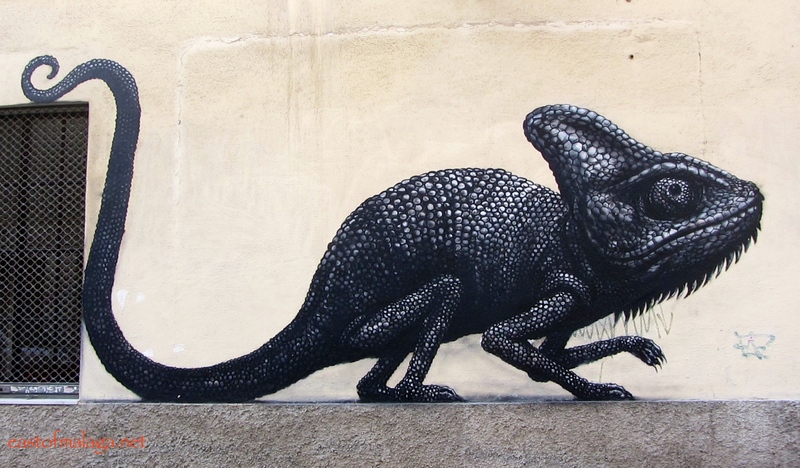 Artists include Dadi Dreucol, the Madrid-based Boa Mistura collective, José Medina Galeote, Andi Rivas and my personal favourite, ROA, who is responsible for the amazing chameleon above. There are many more images than I can display here, so if you want to have a look for yourself, head to the Soho district of Málaga, situated on the port side of the Alameda Principal and east of the River Guadalmedina. Whilst you’re there, you might also want to also look into the Contemporary Art Centre by the river, which is free of charge and well worth an hour of your time. What’s your opinion about street art? Which is your favourite photo? Do let me know in the comment section, and if you like this post, feel free to share it using the social media buttons below. This entry was tagged Andalucía, art, Europe, Malaga, photography, Soho, Spain, street art, travel. Bookmark the permalink. I recently went to Malaga on a field trip and I studied street art and graffiti in southern Spain and had the opportunity to visit this amazing place and view all the art that you have posted pictures of. My group and I have to write up our findings for our project and were wondering if you could help. We have a few questions that we are finding difficult to find the answers for online and hope that you can help. 1. When was the street art introduced? 3. How come the buildings surrounding the area are neglected and run down? 4. Are there future plans for any further development within the area. Even if you do not know all the answers to these questions, if you could help in anyway possible, my group and I would be extremely grateful. This street art has been introduced mostly over the past year. Most of the pieces have been commissioned by the city in an effort to breathe life into a neglected area of Malaga city. Hi Marianne, just come across this via facebook, wow, fantastic, another jewel in the crown of Malaga !! you are right, Malaga is such a fantastic city and very underrated, maybe we should just keep it for ourselves ! they are great photos of fantastic artwork, coming down in March so will be heading to see this, the Chameleon is very special, great technique. Hola Roberto – the chameleon is my favourite, too. Very special. You’ll have a great time in March wandering around the Soho district. The CAC museum (contemporary art) is worth a look, too …. it’s nearby and FREE!!. I can never resist Atarazanas Foodie heaven on earth ! El Tren cafe round the corner does great coffee and Desayuno. I wonder if you have visited Sedella on your travels ? they have a great visitor centre and Museum and are in the process of converting the old Ayuntamiento into a local arts and customs of Sedella museum, there is a real progressive vibe in this charming little village. They’re great, Marianne. There are some incredibly talented street artists around – I can’t begin to imagine how they manage to create such life-like images. My favourite, by far, has to be the chameleon. What a difference this kind of street art is to common-or-garden graffiti. So much talent and It would be wonderful to wander around discovering them they are all amazing but that chameleon is so sculptural he looks as though he is just about to walk off the wall. Love these Marianne but the chameleon is my fav also. I thought it was a statue! These are all really fascinating, Marianne. There’s some serious talent here. Love the last one the most. Oh my, what a wonderful collection. I love them all! I am a big fan of street art. I have quite a few on my blog and highly recommend the Monday Mural meme. I’ve just been over and enjoyed some of your street-art, Debbie. Great blog – your photos are so perfectly captured. I’m going to Malaga for New year so I can’t wait to check this out. I’m with you – the chameleon but it’s all excellent! These are fantastic. I too love the chameleon & will be heading to Malaga to have a look. Thank-you for the info. Wonderful Marianne! Can’t choose but if I had too…the heart !! We do not have as much here in safe areas so I love seeing it from across the world. I’m delighted how much Malaga city has blossomed over the past ten years. Many people think of Malaga as “just an airport”, where they fly into and out of, but it is SO much more these days. There is a real BUZZ around Malaga – it’s such a happening place. Now that makes me want to visit! Love the art work and so beautiful. Thanks so much for your continued support of my blog – much appreciated. Maybe one day we will get back to Spain. I would love to go. Deciding now about next year… we were going to leave China, but now considereing 1 more year. What an array of street arts! Lots of detailing work of the first one. 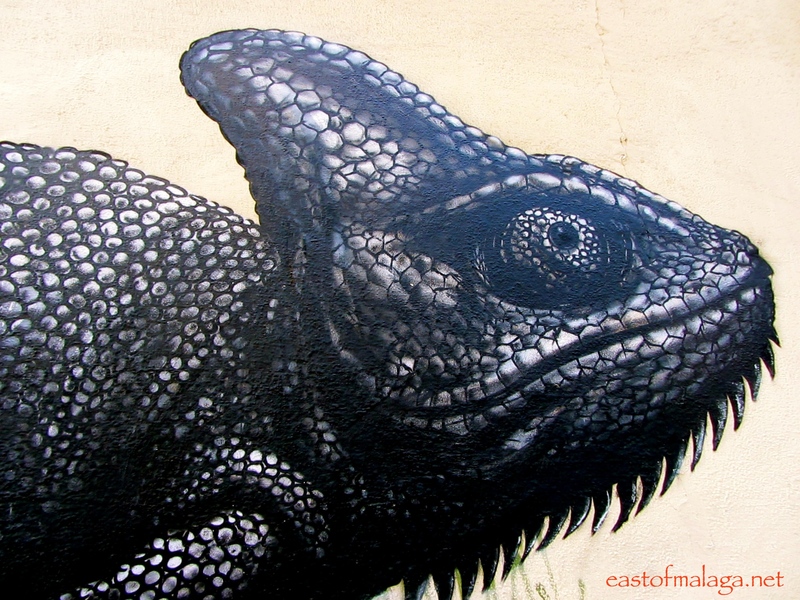 ….. and, I just found out that there is another piece in Malaga by the same artist who did the chameleon. I guess I’ll have to hurry back! I thought the chameleon was a sculpture when I first saw it – fantastic. Although I wouldn’t have many of these pictures on the walls in my home, I like to see them in cities – they reveal all the different personalities of artists, and of people generally. But I don’t like graffiti – it’s too often written on surfaces that can’t be cleaned, like precious old stone walls. Totally agree with you, Trish – there’s a place for this type of art and it’s not in the home. It’s heartbreaking to see graffiti scrawled on precious places. I can’t believe how mindless some people can be. It’s a sad reflection on society when someone does that without thought of it’s significance or history. I love street art even the non-commissioned, and possibly non-sanctioned works. I think street art is the art gallery and commentary of society, accessible by everyone who walks by. But I despise graffiti and tagging, the taggers often tagging over good street art. MAUS is stunning, and features classic work. I like the chameleon but it would be the Jack Fox – for the detail & style – if I had to choose a favorite, which is difficult, they are all great. Like you, EllaDee, I despise graffiti and tagging. Have you seen the amazing street art in the centre of Melbourne? One piece in particular stands out in my memory – it’s huge and the eyes of the girl are just unbelievably haunting. Yes, I like the Jack Fox trilogy, too – it’s HUGE! Marianne — I don’t really have a favorite; I love all of the painted urban art that fills out the spaces of the walls of buildings already there. It looks pretty cool and would love to have a chance to see it in person. Must grand to be able and just look around, daily, and see it all. Hey, Tom – I live about a 50 minute drive from Malaga city – so I don’t get to see it every day, but the city has really progressed over the past 10 years or so since the Picasso museum arrived in town! I’ll do that, but by car so I can see what’s coming and going along the road to Malaga. I’ve never been into street art until earlier this year when we were in Melbourne, Australia where there are some amazing pieces. Thanks for saying and for taking the trouble to look at all the photos, George. I don`t have a favourite-they are all amazing! Me encanta street art and I have hundreds of shots from all over. Yours are wonderful. I love it, too – if it’s done well. Great photos, great street art, great city! Málaga is just getting better and better, isn’t it? I absolutely love street art (and graffiti) I think your favourite is mine too. The line between art and graffiti is one I’ve thought about many times and can’t find an answer! The chameleon is amazing. It almost looks three-dimensional!